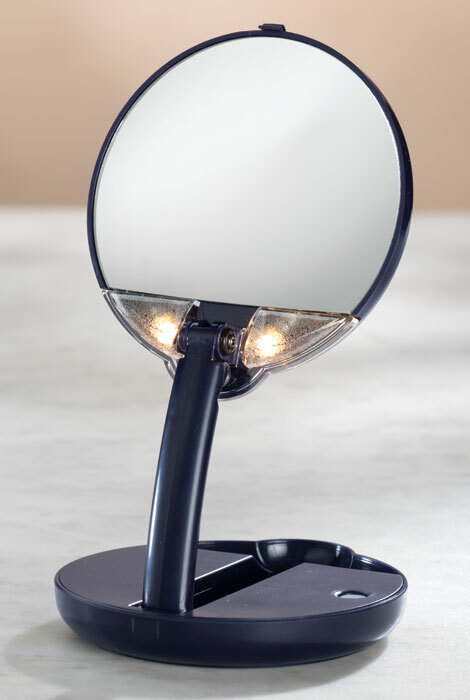 A very portable magnifying mirror that can sit on my bedside table or travel with me. Good size & my wife likes it. I like the stand and the fact that I can use batteries. Helpful travel item and requires no cord. Already have one and love it, this one is for my other home. I chose this mirror because I needed a new travel mirror and loved the fact that it is lighted and uses batteries instead of a power cord. Looking for mirror just like this. I took this on vacation it was great! Because, I can take the portable mirror anywhere, when I'm on the go. Thanks again for your Business. Like the size for traveling. When your eyes need help for putting on eye makeup, this is a great travel mirror. For ease in putting on make up while traveling. Because I needed a new mirror with lighting and magnification for when I travel. Need a magnifying mirror when I am away from home. This one works well and folds up compactly to put in purse or suitcase. i,m 52 and need magnifacation. It is good for taking on long trips so that I can reapply my make up without waiting for a rest stop. I had one of these mirrors for over 5 years now and the base broke on it. I love this mirror! Needed to replace it, and that is why I am buying this today. what is the diameter of each of the lighted make up mirrors, there are three? BEST ANSWER: Thank you for your question. The Travel Mirror is 4 inches, and the 10X and 12X mirrors are 6 inches in diameter.We hope this information will be of help to you. BEST ANSWER: Thank you for your question. The mirror will be back in stock in the next 30 days. We hope this information will be of help to you. how do you change lights if they burn out? BEST ANSWER: Thank you for your question. The manufacturer sells replacement bulbs. We hope this information will be of help to you. 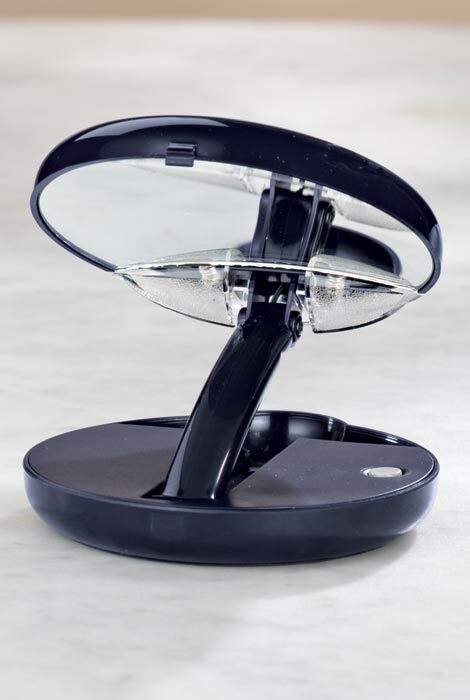 What is the weight of the travel mirror with batteries? BEST ANSWER: Thank you for your question. The mirror itself weighs .4 lbs. Batteries usually weigh 14-15 grams. We hope this information will be of help to you.